In the picture above north is at top right and the image covers 42.0 x 52.5 degrees. Image centre is located at 03:03:46.8, +44:28:38 (H:M:S, D:M:S, J2000) Astrometric data from Astrometry.net. Perseus was the son of the Greek god Zeus and the mortal princess Danae. He rescued Andromeda from the sea monster Cetus; Perseus and Andromeda fell in love, and both were placed among the stars. Perseus had previously slain Medusa the Gorgon. Perseus is often pictured holding Medusa's head in one hand, her baleful, blinking eye represented by the star Algol, whose variability has been known since ancient times. Perseus lies between the Pleiades (M45), the distinctive naked-eye star cluster in Taurus, and Cassiopeia and it rises just before Andromeda. 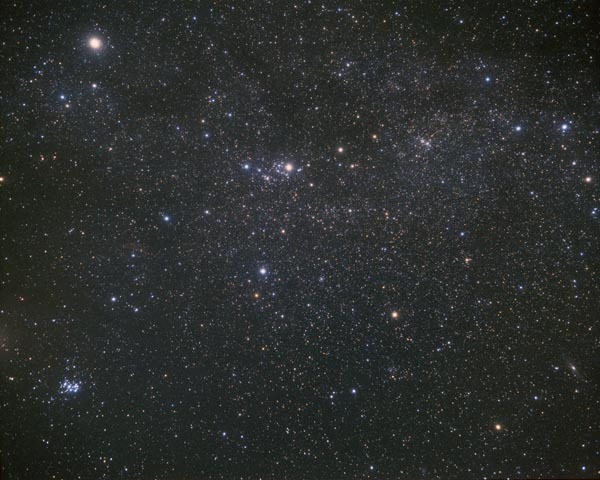 The constellation is one of the largest in the heavens (24th in area out of the modern 88) and is almost 30 degrees across. Its most obvious stars form a curved line known as The Segment of Perseus, and it contains the famous double star cluster h and chi (χ) Persei (NGC 869/884), easily seen in binoculars. Algol, β (beta) Persei, is 93 light years away and is known as the Demon Star (from the Arabic Al Ra's al Ghul). It is the propotype eclipsing variable star, where two close stars orbit around one another and as one hides the other the apparent brightness drops briefly. In the case of Algol the star's brightness drops from magnitude 2.1 to 3.4 (about a third) over a few hours and is faint for two hours before gradually brightening again, The eclipse take about 10 hours in all and happens every 2.87 days (68.8 hours). This regularity was discovered by the 18-year old John Goodrick in 1782 and it was he who suggested the reason for the variability. Algenib	(Mirphak, α Per), Algol	(β Per), Alphecher	(γ Per), Atik	(Menkhib, ο Per), Basel	(δ Per), Gorgonea Tertia	(ρ Per), Menkib	(ξ Per), Miram	(η Per). Andromeda, Aries, Auriga, Camelopardalis, Cassiopeia, Taurus, Triangulum.